Rhubarb has a history of perplexing us humans. It was a mystery to me for a long time (still is, really). It looks like red celery and has a stunningly sour taste. Not to mention, the leaves are poisonous. 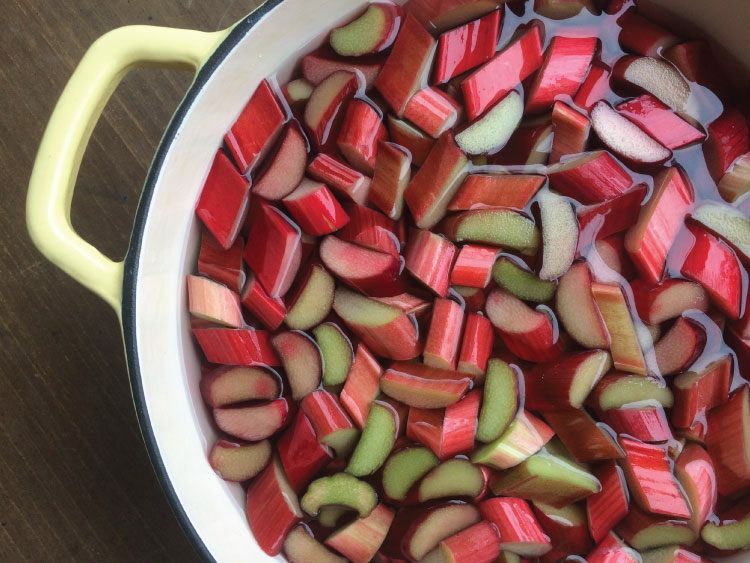 My experience with rhubarb up until a few years ago is this: if someone put a slice of strawberry rhubarb pie in front of me, I would gladly eat it. But that was it; I never sought it out. Anything beyond the classic combo was out of my range. I bet I’m not alone in my narrow experience. 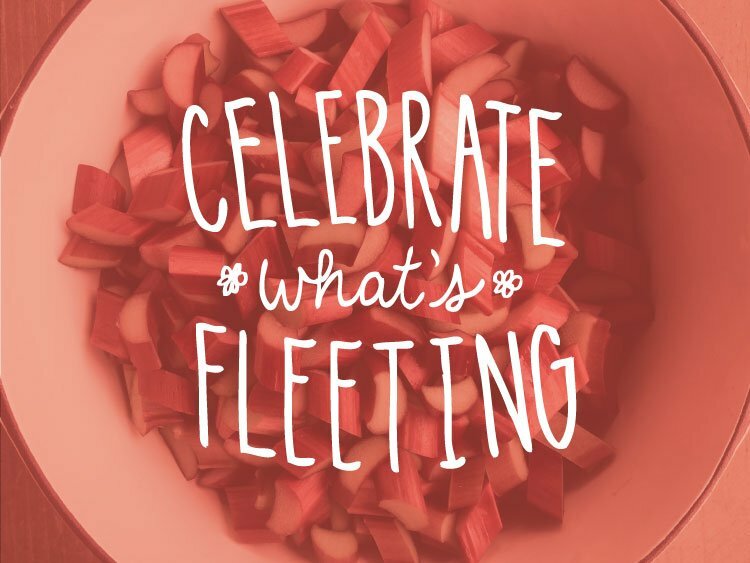 In the U.S., rhubarb is known as the “pie plant.” But, I knew there had to be more to the story than pie. 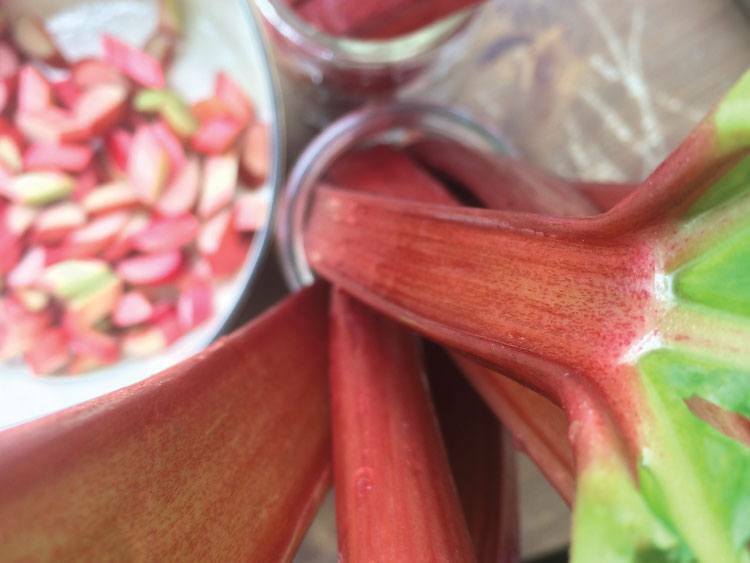 If my memory serves me right, the first time rhubarb graced my kitchen was a couple years ago. I baked up a “strawberry rhubarb bourbon cobbler with ginger oat scones.” Whoa. Given that strawberry rhubarb pie was all I had really known up to that point, this strawberry rhubarb cobbler seemed quite different. Plus, it had bourbon. Since making that dish I’ve started noticing its return each spring. 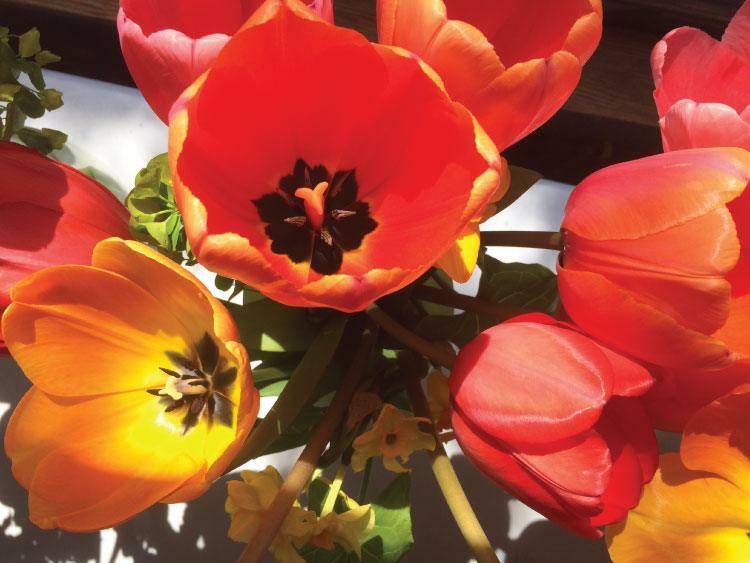 It’s one of the first bursts of color to arrive from local farms post-winter. I look forward to seeing those red stalks shimmering like a jeweled prize after many meals of potatoes, onions, and greens. Rhubarb’s presence is also special because it doesn’t last long. It’s one of the few produce items that still has a season in the grocery store: April through June (in Oregon). It enters with a bang and then gives way to the bounty of high summer. There have been joyous moments when the sun pokes out from its wintery home behind the clouds. Portland has taught me that when the sun’s out, I must go out now, because it’ll dip into hiding again within minutes or hours. There are the flowers in vibrant pinks, purples, and yellows. Blossoms of all shapes and colors burst forth and then slowly trickle to the ground to make way for the next good thing. When I heard that the cherry trees along our waterfront had bloomed, I hurried to go stand underneath them the next day. There’s a sense of urgency to this beauty. 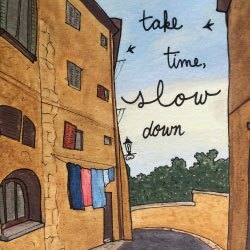 We all know that it could pass by without notice if we’re not paying attention. Right now, I’m in a season of life that matches this urgency to soak it all in. That’s because—by some magical alignment of ages, circumstances, and personalities—many of my closest friends have chosen this year to transition into the next stage of life (what is it about age 30?!). We are entering into marriages, graduate schools, and parenthood, and are moving across countries and oceans. It’s funny how things come into sharp focus when we realize they’re fleeting. We all know the concept that “people want what they can’t have.” I think that’s at play when we realize a period of our lives is coming to a close. It also seemed to be at play in the history of rhubarb. Rhubarb was central to treatment in Asia and then in Europe. The plants that were best for medicine were native to the highlands of western China, northern Tibet, and southern Mongolia, explains Foust. Others, typically lower in medicinal value, grew natively in Nepal, Bhutan, northern India, Siberia, and southwestern Asia. This meant that if the Europeans wanted this precious, elusive rhubarb root, they had to import it. Explorers, missionaries, and botanists quested for centuries to cultivate “True Rhubarb”—the variety from unreachable parts of Asia that was of highest medicinal quality. I’ll make the very long story short: the hard-to-get seeds didn’t always breed true, the environment was not accommodating, and the rhubarb plant proved too complex to comprehend. Foust describes this fruitless quest as a “stalemate of human efforts.” There are some things we can’t simply will to happen. Nature has her constraints, and other people have their own agendas. The Europeans wanted what they couldn’t have. However, they began to notice what was right in front of them. Their efforts to grow rhubarb for medicine had primed their land to grow rhubarb for cooking. “By the 18th century the English were using them to make sweet pies and tarts.” says Harold McGee in On Food and Cooking. The availability of cheap sugar allowed the sour vegetable to be used in sweet dishes. That sugar, along with the 19th century improvements to varieties and growing techniques, produced sweeter, tenderer stalks and caused a rhubarb boom that peaked between the world wars. Eventually, its botanical classification as a vegetable clashed with its popular use in desserts. I was very entertained to discover that in 1947, “the U.S. Customs Court in Buffalo, New York ruled that rhubarb should be considered a fruit since it is used typically as a fruit would be” reports Jennifer Schultz Nelson, a Horticulture Educator at University of Illinois. And just like that, we changed nature. I think we humans like to tell ourselves that we control nature…and sometimes, like in that court case, we’re able to demonstrate our power. But that feels like weak self-assurance to me. What’s more telling about our relationship with nature is the Europeans’ long and failed struggle to pin down medicinal rhubarb. In current times, we have engineered so many items to be on grocery shelves year-round (via complex growing practices or trade networks). It seems that we’ve mastered nature. Yet, I’ve not seen rhubarb appear in December. Somehow, for some reason—natural or societal or otherwise—rhubarb is only available for a short window. I’m glad for that. Because the short sweetness of the growing cycles and the seasons of life bring the preciousness of each into sharp focus. We’re left with what we know now—what is in our present. Let’s revel in it while it’s here. Use rhubarb with other vegetables as traditional German, Polish, and Russian dishes did. You can try this Polish Potato Rhubarb Gratin. Watch the Great British Baking Show! 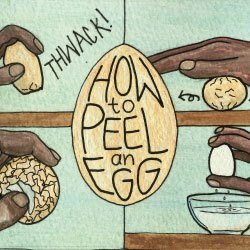 I know…this isn’t a recipe…but I’ve learned SO much about baking from watching it, and it’s really such an uplifting program. 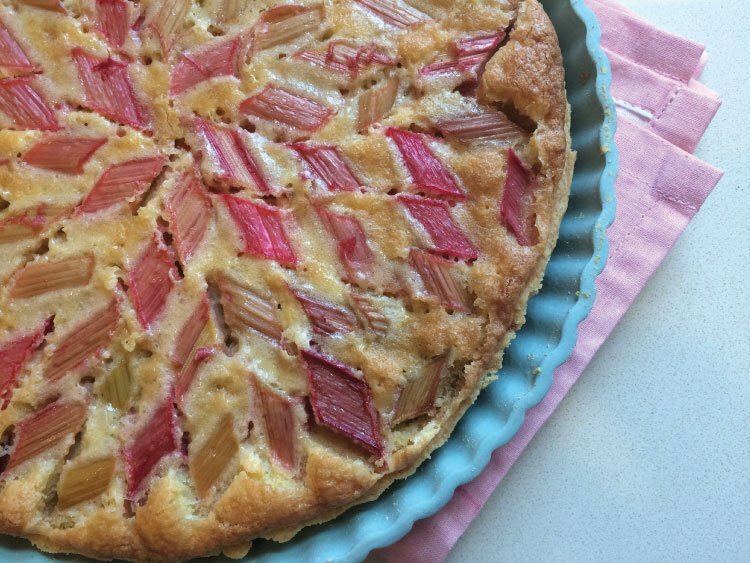 Plus, they use rhubarb in all sorts of creative ways—they inspired me to make a rhubarb custard tart (pictured below). What to plant. Choose a variety that suits your climate and intended use. Some popular varieties include Canada Red, Crimson Red, and Victoria. Many folks go for a variety with a redder stem for flavor, but color and sweetness are not actually correlated. When to plant. You can plant rhubarb crowns in early spring or in the fall when the roots are dormant and the soil is not frozen. 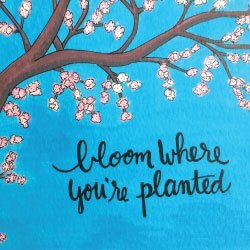 Where to plant. Rhubarb grows best in climates where the ground freezes during the winter. It likes full sun (or light shade if you must) and well-drained soil (although Phil’s are quite wet and yet they thrive). Choose your spot wisely, as rhubarb plants can measure up to 4 feet wide and tall and last 5+ years, and they don’t transplant easily. How to plant. Clear the area of perennial weeds and dig a large hole, about the size of a basket. Fill the hole almost to the top with rich compost or rotted manure—rhubarb needs a lot of organic matter to thrive. Place the crown in the center and cover with 1-2 inches of manure and compost. Mulch with 2 inches thick of straw, compost, or shredded bark. Most people allow 4 feet of space between plants, but mine are more like 1 foot apart and they seem to figure it out each year. How to maintain. Give the plants lots of water, as this is key to producing tender stalks. Some people remove the flowers as they appear in the spring, but I don’t. Maintain a good mulch around the base. Dig and split rhubarb roots every 5 or so years while the plants are dormant in early spring or fall. You’ll know it’s time to divide when the stems are crowded and thin. How to harvest. 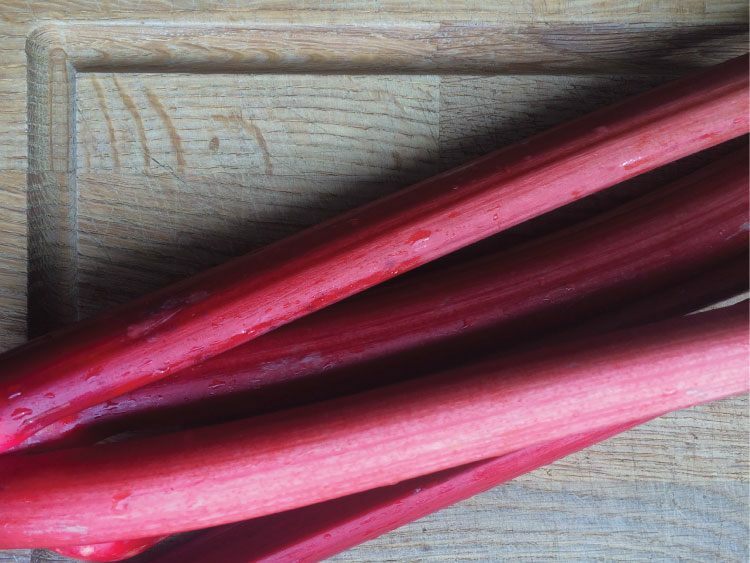 Give rhubarb one growing season to establish, and then begin harvesting in the second year. Once the stalks are 12-18 inches long, grab the base of the stalk and gently twist, pulling upwards to remove. If twisting isn’t enough, you can use a knife. Leave at least half the stalks on the plant each time so they continue growth. Don’t eat the leaves, as they are poisonous (but they make a great mulch). Mature plants typically provide an 8-10 week harvest from April through June. They say it’s best to stop harvesting in July so the plant can build up reserves for the next year, but I actually harvested some last fall and it was great. How to store. Stalks will keep in the refrigerator for about a week. You can also chop them into pieces and freeze them for later use. I hope you have a really joyful celebration of spring!